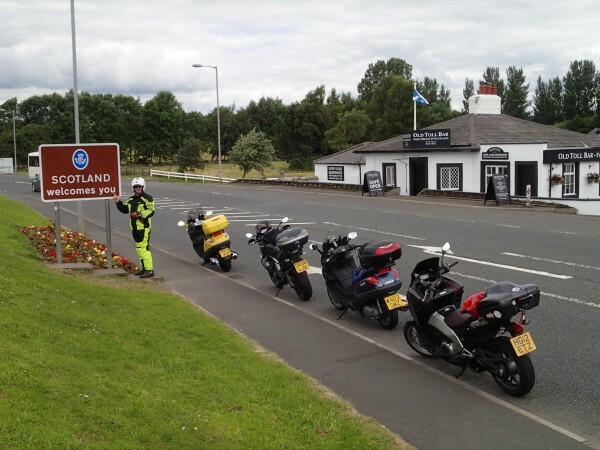 I have returned from a three-night trip to Scotland organised by the lovely Dave M of the X9 Forum. Excellent roads, excellent company, excellent weather - could not have asked for more. I started out by heading west to Kemble, an unusual route to Scotland, to meet up with Howard. It was lashing down with rain when we arrived, and repeated this performance on and off as we rode north to Telford to collect our friend Bob. The three of us set off after coffee, scones and dog-teasing, leaving the rain behind and taking a very pleasant non-motorway route to Dave's place near Preston, where we would be spending the night. We turned in after a welcome meal of pizza, oven chips and cider, at least two of us exhausted by the first and longest leg of our journey. We left on schedule, around ten on Sunday morning, and trekked up the motorway. When we left it, we were in another country. Another hour or so brought us to the Dumfries McDonald's, where they serve Irn-Bru alongside the Coke and Fanta. Refreshed, we pushed on into the countryside, and the scenery improved dramatically. I saw a field of dear little black-and-white goats, and some cows who were black at each end and white in the middle and which Howard later told me were Belted Galloways. Our next stop was Ayr, where forum member Colin had offered us a brew and a look at his stable of ten bikes and assorted cars. From there it was an easy hop to Largs and a night's rest. We crested a hill and saw the sea below us, stopping to take pictures and breathe it in before riding along the coast. Largs was pretty and seasidey. We checked in to our B&B and hit the town, enjoying a curry with a sea view at the Star of India then strolling along the prom with ice cream cones. Ice cream of the day: my favourite raspberry ripple, with a cone dipped in red sparkly sherbet. Tomorrow, there would be ferries. I am actually going to have to look up where we went, as I'm terrible about geography when someone else is leading! Sounds like a lovely trip! And mmm, Irn-Bru. I'm already missing that. I love Irn-Bru, though the sugar-free version isn't that easy to find outside Scotland. One of my local supermarkets sells it, though! Ah, cool! I've never tried the sugar-free version, just the regular variety. I doubt either's something I should drink all the time, but if it were available here it would be a nice alternative to the occasional coke. Ooh, thank you for posting this -- and the others in advance! =:D I really like that last photo; looks like you had some very good weather, which is excellent! 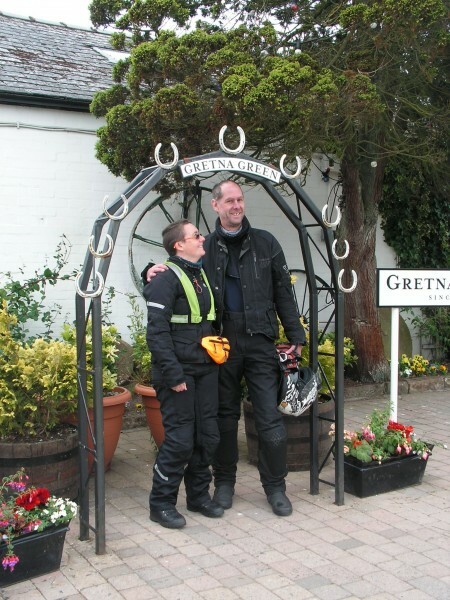 Never actually been to Gretna myself, just past it on the train/M6. Were the ice creams from Nardini's, by any chance? I've never been to Largs, but if I ever do, that place will be on my list! I hadn't heard of it before, but I could see why it's so famous - that frontage, just for starters! None, though I was constantly paranoid and wore long socks! You know how I read that, of course. > You know how I read that, of course. I've gone a bit panorama-happy since I discovered that mode!